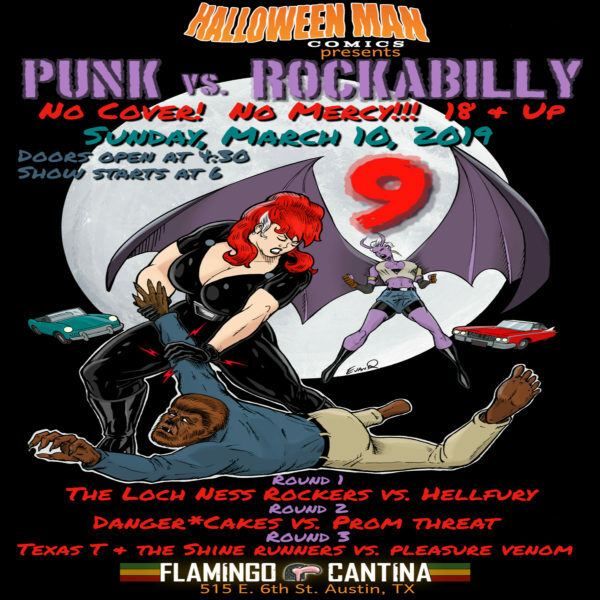 The Punk vs. Rockabilly Showcase kicks off unofficial SXSW with three rock-n-roll rounds of punk verses rockabilly! Team Punk will be represented by Hellfury, Pleasure Venom, and Prom Threat; whereas, Team Rockabilly will be repped by The Loch Ness Rockers, Danger*Cakes, and Texas T and the Shine Runners. No wristband, no cover, and NO MERCY! This 9-year-running showcase is an unparalleled experience that helps define what it means to “Keep Austin Weird.” With three rounds of music battles, the Punk vs. Rockabilly show will definitely captivate the crowd. Although all three rounds feature talented artists in their respective genre, Round 3 is sure to be hell fire as Texas T and the Shine Runners face off against Pleasure Venom! Both artists have produced new albums within the last year, so they should be bringing their latest jams to the competition. Pleasure Venoms’ dark post-punk will be a great contrast to the rocky-folk tunes from Texas T and the Shine Runners! Whether you’re into rockabilly or if punk is more your style – the Punk vs. Rockabilly 9 performance is going to be a mean spin on the traditional local showcase, offering concert goers an unforgettable experience not to miss.